For the second time in three weeks, the Denver Broncos beat the Kansas City Chiefs as Peyton Manning, throwing five touchdown passes, showing that rough and icy weather isn’t really an issue for him and his team in general, and on the way taking care of their pesky rival from the AFC West, close to closing the book on the division, making sure they’ll finish first in the division and probably the conference. 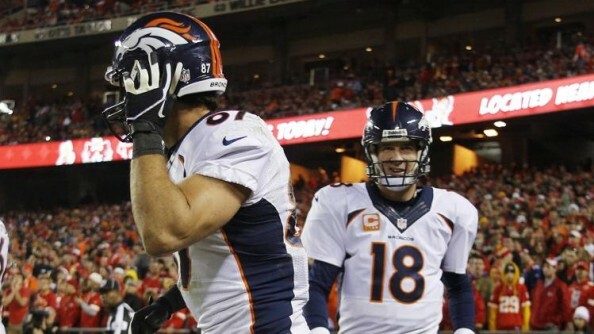 It’s not over for the Chiefs in the division – they’re 9-3 with the Broncos at 10-2. However, it’s hard to see the Chiefs, losing in the head-to-head with Denver, somehow winning the top spot in the division. What’s worse? Justin Houston not playing has exposed and weakened their best asset, the defense, which has been unable to be really effective during their three-game losing streak. Manning was extremely effective when it came to the long game, not getting sacked once and having plenty of time to find open receivers. He did throw two interceptions, but when you go deep so many times, that’s bound to happen. Overall, the benefits outweighed the mistakes he made. He completed 8-of-10 passes for 15 yards or more, connecting for 268 yards, three touchdowns and two interceptions. He and Eric Decker had a special understanding during the game. He targeted him six times, completing five passes, matching the total of completions on deep passes to Decker from the previous three games. Manning completed 80% of his deep throws, the highest since 2006 in a game with at least five such attempts. Eric Decker, who caught 8 passes for 174 yards, is the first receiver in franchise history with four touchdown receptions. He is also the first player to catch three passes more than 30 yards downfield in a single game since Malcolm Floyd in Week 5 of 2010 against the Raiders. There was also a big difference in the quality of pressure both teams were able to put on the quarterbacks. Alex Smith wasn’t sacked, and he finished with a negative TD-Int differential against the blitz for only the second time this season. The Broncos blitzed on 23 of his 46 dropbacks this season, the most we’ve seen from them this season. Smith completed 11-of-20 passes against the five man pass rush, throwing one interception and no touchdowns. Missing Justin Houston has been a huge issue for the Chiefs, now losing three games in a row. Opposing QB have thrown more interceptions than touchdowns with Houston on the field, completing 54.8% of their passes. Without him, they’re completing over 66% of their attempts. Erick Decker – I think he showed people why he’s so great. How we run our offense, we’re very versatile as far as going inside, outside, left, right, whatever it may be. Fortunately I had some play calls and took advantage of the opportunities I got.